In the rear view mirror, second quarter GDP was revised down from 2.5% to 2.0%. The more forward looking durable goods orders declined for a second month, down -0.7%. Another leading indicator, the University of Michigan final consumer sentiment reading for November showed that consumer confidence has rebounded about halfway from its debt ceiling debacle collapse that began in July. Personal income was up 0.4%, while spending rose only 0.1%. The personal savings rate rose .2% to 3.5%. With the continuing exception of Oil prices, and a small increase in corporate bond yield spreads, all of the high frequency weekly indicators turned in another positive week. Let's start again this week by looking at jobs. While there was some weekly noise, the trend remains positive. 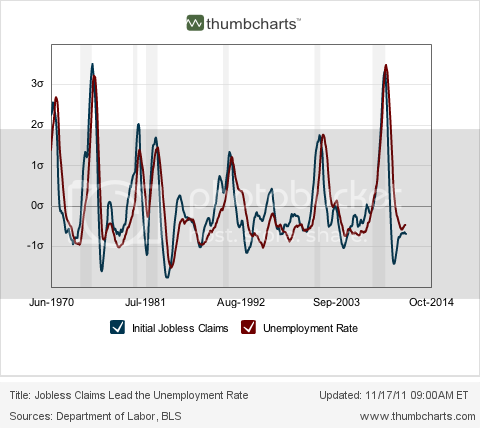 The BLS reported that Initial jobless claims rose 5,000 to 393,000. The four week average declined 2500 to 394,250. The four week average remains close to its best reading in over 3 years. The American Staffing Association Index rose by 1 to 92 last week. In the last couple of months, this series has resumed a slight upward trajectory, but remains lower YoY. Tax withholding returned to a positive YoY reading this week. Adjusting +1.07% due to the 2011 tax compromise, the Daily Treasury Statement showed that while for the first 16 reporting days of November, $109.7 B was collected vs. $112.1 a year ago, a decline of -2.4 B, for the last 20 days, $137.5 B was collected vs. $130.0 a year ago, an increase of $7.5 B or 5.7%. I use the 20 day metric precisely because there is a definite pattern to deposits by day of the week. Thus it appears that last week's negative YoY 4 week loss may have been an outlier. This will be closely watched in the next several weeks. Housing continues to show stabilization. The Mortgage Bankers' Association reported that seasonally adjusted purchase mortgage applications increased 8.2% last week. On a YoY basis, purchase applications were up 4.8%. Although YoY reports have been negative for several months, the actual change is very slight, and we remain firmly within the range that purchase mortgage applications have been in since May 2010. Refinancing fell -4.0% w/w despite near record low rates, and may have been strongly influenced by seasonality. YoY weekly median asking house prices from 54 metropolitan areas at Housing Tracker showed that the asking prices declined -0.3% YoY. Once again, this is a new "best" YoY reading in 5 1/2 years. The areas with YoY% increases in price increased to 21, meaning that 40% of all metropolitan areas in this survey now have YoY positive changes in asking prices. Only Chicago still showed double-digit YoY% declines. YoY asking prices for houses could turn positive on a nationwide basis as early as this week. Retail same store sales remained positive as they have been all year. The ICSC reported that same store sales for the week of November 12 decreased -0.9% w/w but increased 2.8% YoY. Shoppertrak reported that YoY sales rose 3.8% YoY but were off -3.4% week over week. We have entered a period of high seasonality, so the YoY figures are by far the more reliable measure of sales. The American Association of Railroads reported that total carloads increased 1.9% YoY, up about 10,400 carloads YoY to 545,100. Intermodal traffic (a proxy for imports and exports) was up 7,000 carloads, or 3.0% YoY. The remaining baseline plus cyclical traffic increased 3400 carloads or 1.1% YoY. Total rail traffic has improved substantially in the last two months after having turned negative for 6 of 12 weeks during the summer. Weekly BAA commercial bond rates rose .04% to 5.16%. Contrarily, yields on 10 year treasury bonds fell .03% to 2.02%. This is the second week of very small increasing spreads in contrary directions. If it were to continue and amplify, it would represent significant weakness. Finally, the Oil choke collar remains engaged, as Oil closed at $96.77 a barrel on Friday. 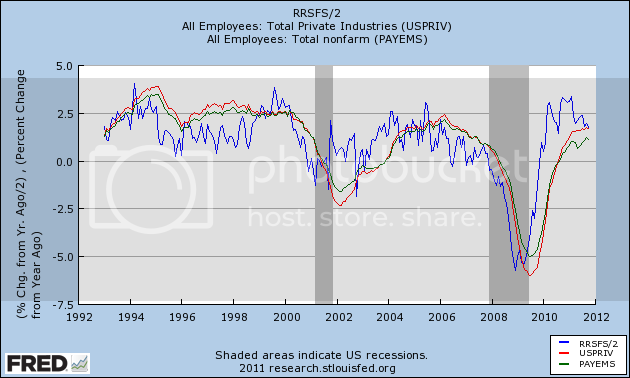 This remains above the recession-trigger level calculated by analyst Steve Kopits. Gas at the pump decreased $.07 to $3.37 a gallon. 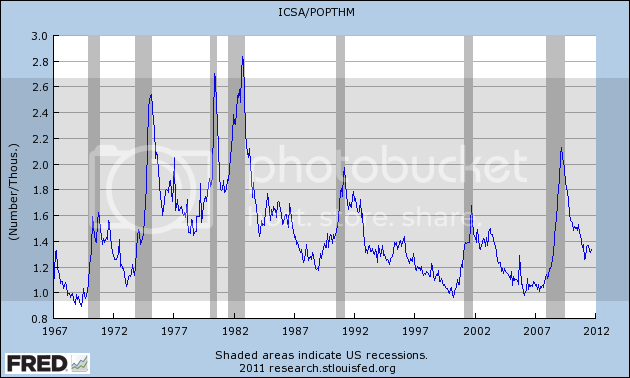 Measured this way, we probably are about $.10 above the 2008 recession trigger level. Gasoline usage is once again off substantially, down -2.7% YoY, at 8592 M gallons vs. 8829 M a year ago. The 4 week moving average is off -3.9%. This continues to suggest that consumers have permanently altered their gasoline usage habits towards more conservation. Money supply was not reported this week. If ECRI's recession call is correct, it appears it will have to be imported from Europe and China via manufacturing, or else the consumer is going to have to finally give out due to real wage declines. There is simply no sign of recession in the recent weekly indicators. More specifically, the continuation of sub-400,000 initial jobless claims reports suggest that we will see a good jobs report this coming Friday. 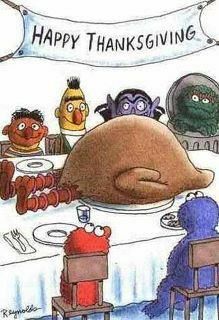 This Thanksgiving something like 99% of Americans owe a special thanks to the Occupy Wall Street movement. It is not a question of what the movement does next, or what agenda or specifics it needs to succeed. It already has succeeded, and the only question is whether its success will continue. Let's flash back nearly 5 months. The House Republican caucus refused to pass what until then had been a pro forma raising of the US's debt ceiling, taking the payment of our country's debts hostage to partisan demands about cuts in social spending. Over the Fourth of July weekend, President Barack Obama proposed a "grand bargain", for the first time explicitly proposing cuts to Medicare and Social Security as an enticement to obtain tax increase concessions from the GOP. The GOP still refused, even though the proposed "bargain" was weighted something like 10 to 1 in favor of spending cuts over tax increases. At the end of the day, only 174 House Republicans mustered the political courage to vote in favor of paying this country's bills. Nancy Pelosi and the Democrats had to come to their rescue on August 2. In direct reaction to that debacle, Standard and Poor's downgraded the US's credit rating from AAA two days later. During that 5 week period, according to the daily Gallup poll, the economic confidence of Americans plummeted - to ratings not seen since the worst of the "great recession." Economic indicators began to show outright contraction by mid-August. More and more it looked like a recession might be about to start. A group calling itself "New Yorkers Against Budget Cuts" announce[d] a meeting on Wall Street on August 2 to protest potential austerity measures as a result of the debt-ceiling crisis. That day, another set of protesters planning for an upcoming "occupation" protest joins them, and, according to occupywallst.org, after the assembly the two groups "gather into working groups to plan for the September 17 occupation of Wall Street." As Dean Baker described so well yesterday, the OWS movement has successfully forced the mainstream media and Washington to acknowledge that by far the biggest problem facing this country is not deficit reduction at all, but rather the now-chronic lack of jobs in the economy, and the longstanding and ongoing and increasingly disparate distribution of income in the US, due to economic and tax policies that favor an upward redistribution of wealth to a very few at the top, who are "too big to fail", vs. "the 99%" for whom there are no bailouts but only calls for austerity and sacrifice. That relentless focus by the OWS movement has shone the bright light of day on the efforts of the elite in Washington to enshrine the Bush tax cuts for the wealthy while spending cuts are proposed for everybody else. As a result, OSW is directly responsible for two outcomes in Washington in the last two weeks. One is the failure of the 'Supercommittee' in which Democrats refused to capitulate to GOP demands of no meaningful tax increases, and unlike July refused to dangle ever larger Social Security and Medicare cuts as an enticement. As a result, on January 1, 2013 the Bush income and estate tax cuts are set to expire, and cuts in military and general domestic spending will make up the difference. Secondly, GOP hostage-taking came to an abrupt and very quiet halt. The latest stopgap budget resolution was set to expire on Saturday November 19. In stark difference to their behavior earlier this year, the House Republican caucus quietly passed another stopgap resolution to avoid a government shutdown through December 16. Meanwhile economic confidence has regained at least part of its lost ground, and recent data shows that Americans are increasing their spending on purchases like cars. The threat of at least an imminent domestic recession appears to be receding. Without the Occupy Wall Street movement, I doubt very much Washington would have been derailed from its toxic austerian plans. So this Thanksgiving Day I say "Thank you, OWS." My father is in for the holidays, so I think this is a good time to sign off for the already holiday shortened week. We'll be back next Monday. U.S.-based multinational corporations added 1.5 million workers to their payrolls in Asia and the Pacific region during the 2000s, and 477,500 workers in Latin America, while cutting payrolls at home by 864,000, the Commerce Department reported. The faster growth abroad was concentrated in emerging markets, such as China, Brazil, India and Eastern Europe, according to economists Kevin Barefoot and Raymond Mataloni, of the U.S. Commerce Department. "Judging by the destination of sales by affiliates in those countries," the economists wrote in a recent survey, "the goal of the U.S. multinational corporations' expanded production was to primarily sell to local customers rather than to reduce their labor costs for goods and services destined for sale in the U.S., Western Europe and other high-income countries." This is a a point that needs to be stressed when we're talking about the "outsourced" jobs. In reality, there are many regions of the world that are growing at far more impressive rates than the US. In addition, these are new markets with an emerging middle class. That means is simply makes more sense to locate the factories and manufacturing facilities in these countries to sell to that market. For those of us in the economic blogsphere, Barry Ritholtz over at the Big Picture is a bit like a blogfather. He was one of the first economic bloggers who I read regularly. We've traded some occasional emails and he's always been very gracious. His latest Washington Post column illustrates why he has such a great reputation: his research is exhaustive, which appeals to the academic side of me. His latest column for the Washington Post adds much more intellectual weight to the argument that the CRA and the other government GSEs weren't the cause of the financial mess. This is an incredibly good point, and should put the argument to bed for good: did the rest of the world have CRA legislation or GSEs" If not, why did these economies also experience an economic bubble? So, prices spiked in neighborhoods that weren't the targets of the legislation. That's one powerful law if it can effect economic areas not intended to be effected. The private market underwrote the vast majority of the sub-prime loans. These organizations weren't subject to the law. And that's the buzzer ending the game. For those of you who still adhere to the CRA/GSE line of argument please do us a favor: don't reproduce. And a special thanks to Barry for being intellectually rigorous at a time when our political and economic discourse is incredibly stupid. The 5-minute charts clearly shows prices consolidating and then breaking support at the 123 level. Prices are now moving lower in a downward sloping channel. When trading patterns -- like this topping triangle pattern -- the general rule of thumb is to measure the height of the pattern and the subtract or add that to the break-out point to get a price target. Here, the height is roughly 7 points (122-129), so our price target is in the 117 range. I've added the Fibonacci levels for added measure. I've added some of the technical indicators to the graph to show that overall, volume is weakening and the MACD is showing declining momentum, as well as giving a sell signal. In short, the weight of the evidence is clearly in the "market moving lower" camp. This jibes with the overall fundamental situation, which is also equity negative. 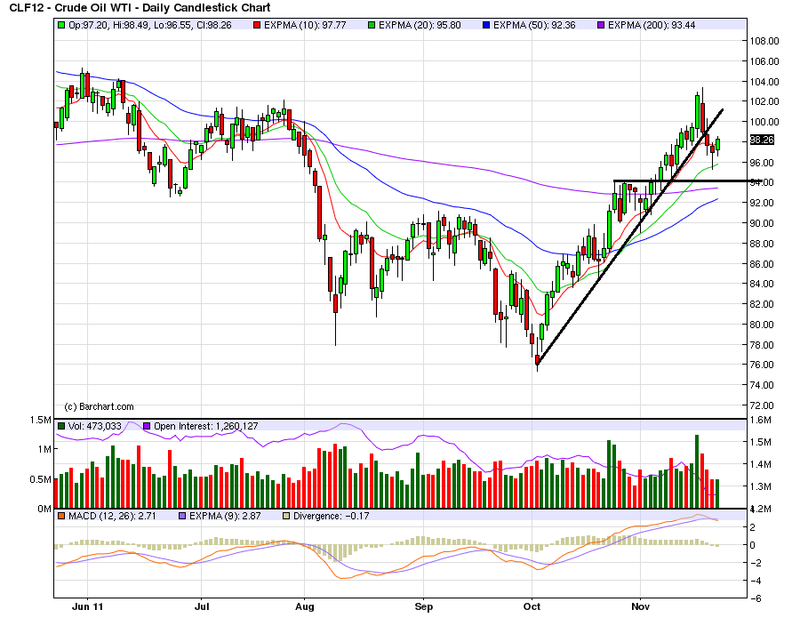 Oil has broken through its upward sloping trend line and is now trading around the 10 day EMA. While the EMA picture is still bullish, the 10 day EMA is now moving sideways, telling us the shorter trend is weakening. Also note the MACD has given a sell signal. The next level of support is around the 200 day EMA, where we also have previously established price levels. 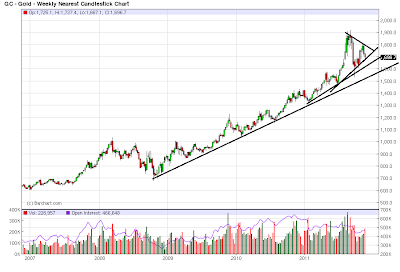 Gold is still in the middle of a multi-year rally, with several trend lines currently supporting prices. However, notice that prices may be forming a topping pattern right now, indicating the rally may be over. Supporting that view is the current 6-month daily chart, Notice there are two failed rallies, with the second topping below the first. Also note the weakening EMA picture, with the EMAs unable to show maintain a strong rally posture. Is vocational training the answer? It's been quite a while since I looked at detailed metrics of future job growth, something I devoted a lot of time to a couple of years ago. With a divergeance in forecasts between recession vs. continued growth, this is a good time to take another look. Some of the metrics have performed better than others. Many continue to support optimism, but at least one is downright ominous and may be telling us that revised jobs data will show substantial job losses from earlier this year. One point I frequently made is that this is a "bifurcated recovery", where manufacturing and sales are performing much better than job and income growth. Although we've had a recent slowdown in some ISM series, the description of a "bifurcated recovery" is still valid. 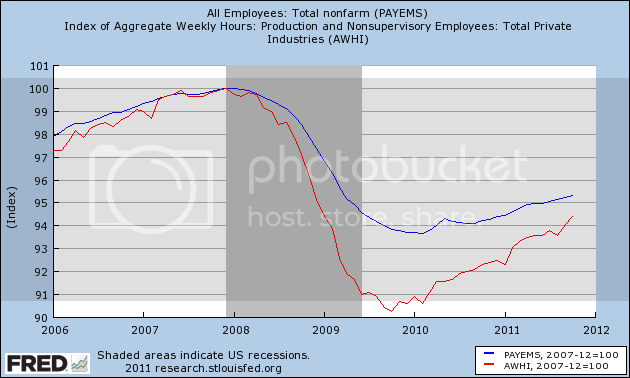 If the trend continues then by about next summer aggegate hours (red) will have made up all of their comparative losses with jobs (blue) and we can start to expect job growth to fully reflect growth in hours. 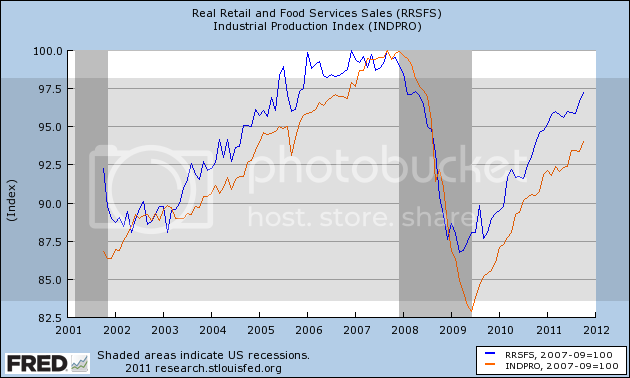 The closest thing I found to a "holy grail" leading indicator for future job growth when I took a thorough look over 2 years ago was real retail sales. 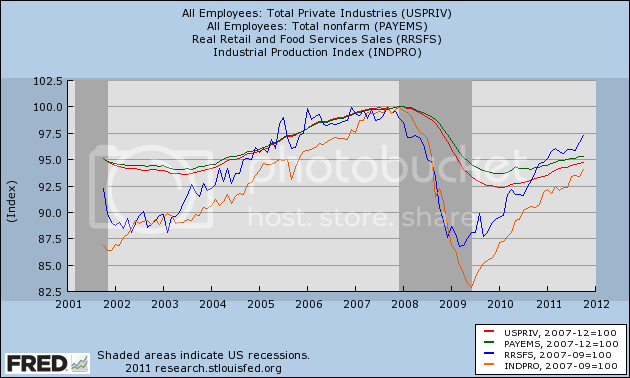 Real retail sales tended to lead turning points in jobs by about 4 to 8 months. Since sales are still rising, we should expect continued job growth over the next few months as well. (This metric has also recently been touted by Prof. Karl Smith of UNC - Chapel Hill at Modeled Behavior). This is yet another indication of just how significant government job losses have been to the relatively poor jobs recovery. At the same time, because real retail sales are a leading indicator for jobs, this reinforces that we should expect to continue to see positive job growth in the economy, with private jobs at least being added at something like a 2% YoY rate. No break in trend happened. Since this scatter graph ends with October, it doesn't show the decline in the 4 week moving average below 400,000 in the last couple of weeks. Should that continue through the end of November, I would expect a very good November employment report, with something like 175,000 private jobs being added. Okun's law is actually a rule of thumb that holds that for every 2% YoY increase in GDP, there should be a 1% decline in the unemployment rate. Generally speaking, 2% YoY GDP growth equals no change in unemployment. 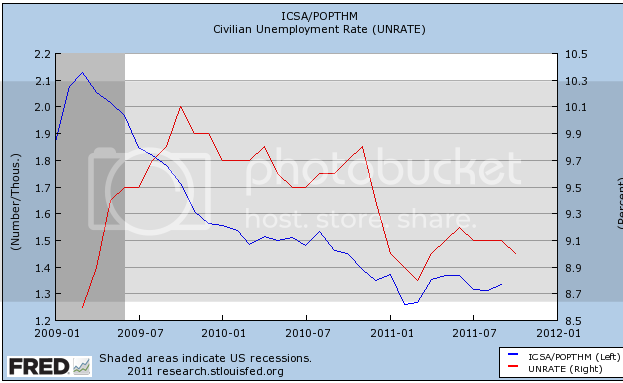 A 4% GDP increase gives you a 1% decrease in unemployment. 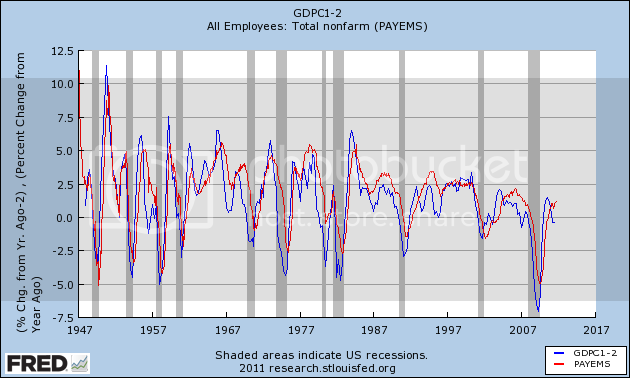 Contrarily a 0% YoY change in GDP gives you a 1% increase in unemployment. Since 1948 there has never been a period of 2 or more quarters where YoY GDP% growth was under 2%, that has not equated actual YoY job losses in the next few months. If this relationship holds true now, then contra all of the other above data, we should have already been seeing outright job losses, and they could continue through the winter. As I said, this contradicts virtually all of the previous indicators we have discussed. A possible explanation comes via Jeff Miller of A Dash of Insight, who informed us yesterday that the BLS's Dynamic Business Report of actual job data collected from the states showed that in the first quarter of this year only 250,000 jobs were created, rather than the 500,000 previously reported. If this revision is applied to all of the 2011, it would mean that the pathetic job gains of this past summer turn into outright significant losses. Not only would this tend to vindicate Okun's law, it would affect all of the data sets above. For example, the scatterplot graph above would probably then show that we did indeed break trend in the direction of a "double-dip." 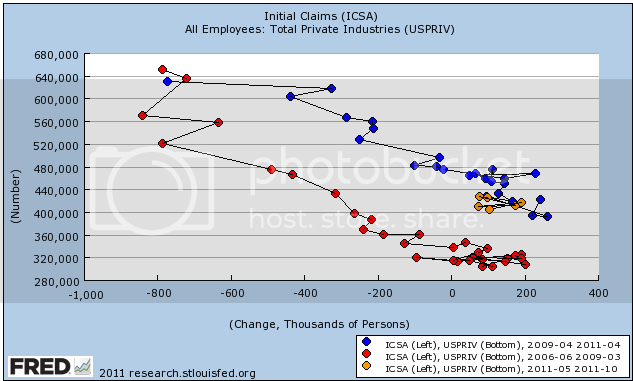 So adjusted, the recent initial claims levels aren't so bad. In fact, they are better than most readings during the last 50 years. 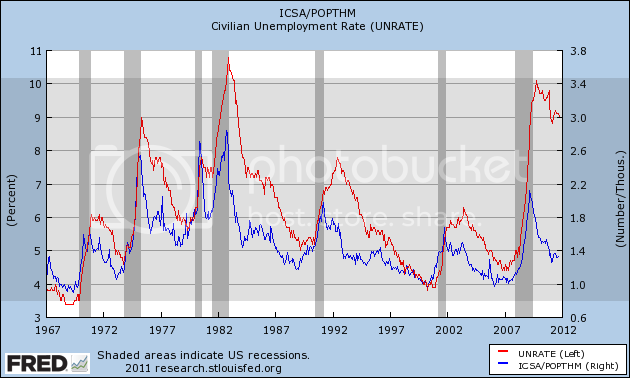 This metric likewise predicts a continued decline in the unemployment rate over the next few months. Continued job losses in government continue to have a depressing impact on job growth during this recovery, causing distinctly subpar growth compared with previous recoveries. Undoubtedly as I have pointed out just a few days ago, that housing until recently did not participate in the jobs recovery also has had an effect. At the same time, most of the above metrics suggest that we should see continued job growth in the months ahead, and a continuing decline in the unemployment rate compared with a year ago. If present underlying economic trends continue (as to which there is obviously no guarantee), then by next summer or so we may see stronger job growth as the deficit in aggregate hours is completely made up. 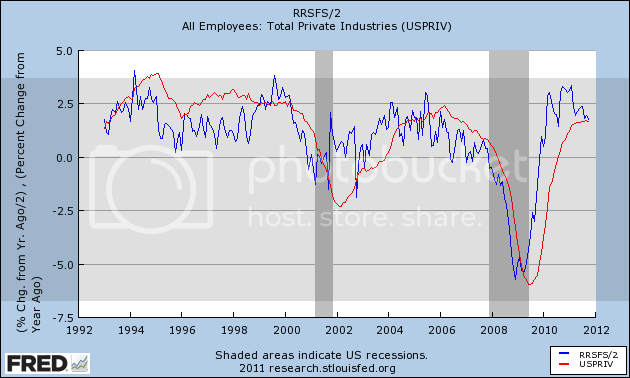 The contrary indicator is Okun's law, which suggests we should already be in the throes of actual job losses. It is possible that we will find when the jobs data is revised that we did lose a significant number of jobs earlier this year, but that the situation will improve going forward from here, which would be more consistent with all of the data sets above. 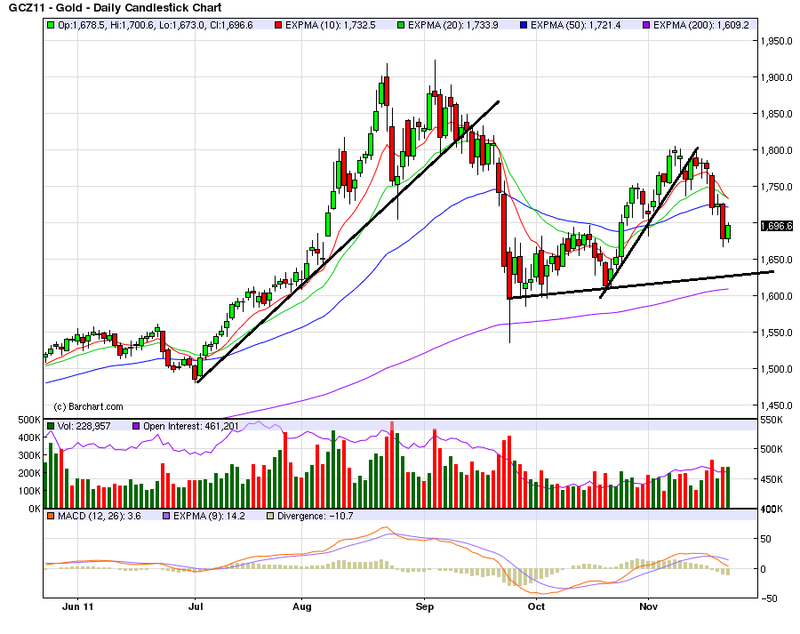 The IWMs hit resistance at the 200 day EMA and moved lower. They are now resting on the 50 day EMA. The long lower shadows over the last two trading sessions show that prices have moved below key support levels, but closed higher. 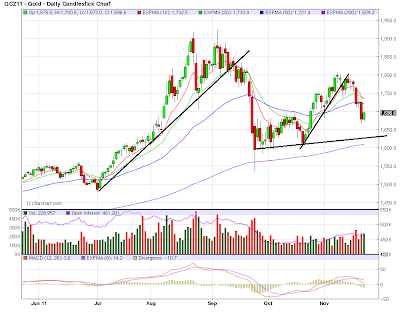 The QQQs, broke lower, printing one strong candle and a shorter one on Friday. Thursday's volume number was pretty strong, but Friday saw a drop. The SPYs have moved thorugh the 200 day EMA and have printed closes right below the 50 day EMA over the last few days. The combined impact of these charts is simple: as a combined unit, the equity averages are pointing lower. The QQQs have the strongest technical support as they are sitting on the 200 day EMA, while the IWMs are right at the 50 day EMA. As a general FYI, the general rule of trading thumb to use when trading a consolidation pattern is figure out the height of the pattern at its widest/largest and subtract that amount from the point where prices break through. The long end of the treasury market moved higher last week, but notice that prices did not close above previously established highs. Also note the volume was incredibly weak, indicating a lack of movement into the market. This tells us that traders are looking for another safe haven asset. Although it printed stronger volume, the dollar is still in the middle of an upward sloping channel and is also centered right around the 200 day EMA.